Do Christians Need to Read the Old Testament of the Bible? Since the New Testament Focuses on Jesus Isn’t It All We Need? We read the Bible because it reveals God to us. It is the foundation of our faith. 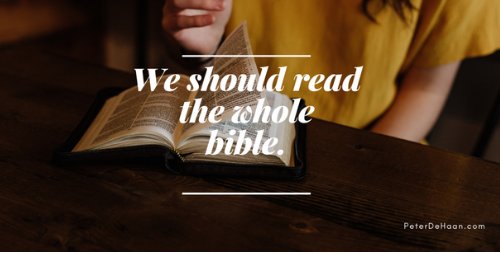 But do we need to read all scripture, the whole Bible? As Jesus wraps up a lengthy sermon, the one we call the Sermon on the Mount, he gives us a one liner that we recognize as the Golden Rule. He tells us to treat others the way we want them to treat us. Then he adds a curious addendum. He says this one instruction summarizes the whole Law and all that the prophets wrote (Matthew 7:12). These writings—the Law of Moses and the prophets—encompass what we call the Old Testament of the Bible. If treating others right, the way we want them to treat us, distills everything in the Old Testament, there seems no point in reading it. Right? In fact, the New Testament provides all the essential information we need to follow Jesus and be made right with Papa. This informs our present physical life and anticipates our future spiritual life with God in heaven. The New Testament is enough. Or is it? Yet early in the same sermon, Jesus says he didn’t come to abolish (that is, do away with) the Old Testament—the Law and the prophets—but to fulfill them (Matthew 5:17). If Jesus isn’t tossing out the Old Testament but is instead building upon those writings, aren’t they also foundational to our faith and understanding of God? Though we can view the New Testament as containing all the essential faith information we need, understanding the Old Testament adds meaning; it deepens our understanding of the symbolism, power, and purpose of the New Testament. For example, how can we fully appreciate Jesus’s sacrifice and dying for our sins, without knowing the backstory in the Old Testament? That’s why we need the Old Testament. Though the New Testament may be enough, the Old Testament amplifies it. Consider what Paul writes to his protégé Timothy. Paul says, all scripture is useful to inform us in our faith and life (2 Timothy 3:16). He doesn’t say the New Testament is useful, which, by the way, didn’t exist when Paul wrote to Timothy. From our understanding today, when we read Paul’s words that all scripture is useful, we conveniently include the New Testament in this. It’s not wrong to do so, but it is an expansion of what Paul wrote nearly 2,000 years ago. As we study the Bible today, we will do well to study all of it. Yes, the New Testament is more applicable. Yet the writings of the Old Testament—all them—carry meaningful significance. Therefore, we should keep in mind to not focus so much on the New Testament that we ignore the Old. As Paul wrote, all scripture comes from God. It is the Word of God, God breathed. It is useful to us in our daily life. It teaches us, rebukes us, and corrects us. It trains us in how to live right. It prepares us to do good (2 Timothy 3:16-17).